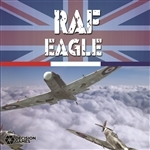 You are here:Home > Search Results for:"RAF Eagle"
RAF: Eagle puts you in control of the Luftwaffe forces raiding England. You schedule raids and assign missions to your bombers and fighters, attempting to deliver the knockout blow. Can you take out the British radar system and cripple their aircraft production? The game controls the RAF response to your strategies. How does a foe so close to defeat keep coming back? The sky over Britain in 1940 was the scene of one of the decisive battles of World War II. This is a two-player game covering the most critical period of the Battle of Britain, in which both players move and fight with units representing historic wings and groups.